England won the first Champions Trophy medal in their history, beating Germany 2-1 to clinch bronze in Nottingham. Germany led through Maike Stoeckel's close-range deflection but Susie Gilbert equalised with a tap-in before Crista Cullen's winning penalty corner. England's women had never previously placed higher than fifth in the event. "It's amazing and the girls thoroughly deserve it for the work they put in over the week - it's no fluke," England captain Kate Walsh told BBC Sport. "I'm so proud of the girls, going down 1-0 was really tough but we fought, we came back, and it was a fantastic performance." England head coach Danny Kerry said: "I knew the girls would be fine. There was a nice, steely look about them. That sounds a bit blase, but sometimes you just know." England's match-up with Germany may have been for bronze rather than gold, but it had promised to be a fascinating, rancorous tie after a dispute over a video referral in their earlier group stage meeting, which the home side won. Moreover, while a bronze medal play-off tends not to possess much glamour, reaching it represents a step forward for an improving English side. England had won only one of their 18 Champions Trophy games prior to this year's tournament and a place in the top four was their stated ambition this time. They comfortably met that expectation but, having so nearly made the final, a bronze medal still leaves behind a sense of what might have been had they not been held to a draw by New Zealand a day earlier. The hosts fell behind on Sunday when Stoeckel, all on her own in front of goal, turned a sharp mid-air deflection around Beth Storry. That called a halt to early England forays into the German half as the hosts were forced to chase the game, while they seemed to lack pace in their occasional counter-attacks. Nicola White's superb diving effort only found the post after a Cullen cross, before Cullen herself was denied with the last action of the first half, her deflected penalty corner rebounding to safety off unsighted German goalkeeper Barbara Vogel. England were a vastly improved side in the second half, and they drew level as another spilled penalty corner dropped down for Gilbert to convert from no distance. Walsh then sent a reverse-stick shot flying wide, while Storry rushed out to deny Germany's Lina Geyer at the other end. Cullen found what proved to be the winner, sending a penalty corner straight through Vogel with 18 minutes still to play. 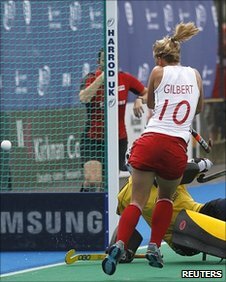 Charlotte Craddock nearly added a third as Germany's defence began to crack, but two goals were enough for bronze as Janne Mueller-Wieland failed to claw a final German chance into the gaping England net. "I thought there was only one team in it," said Kerry. "We had nine penalty corners, they had none. We controlled the game, penetrated them, looked dangerous and it was a matter of time. "It was an awesome response and that will serve us very well in the next few years. "We've been here before and not come out the other end but this time we came out the other end, which was awesome." Walsh added: "Yesterday (against New Zealand) was so disappointing and we had a short amount of time to pick ourselves up, but we believe. "We've known we can do it throughout the tournament and we came back and did it today." 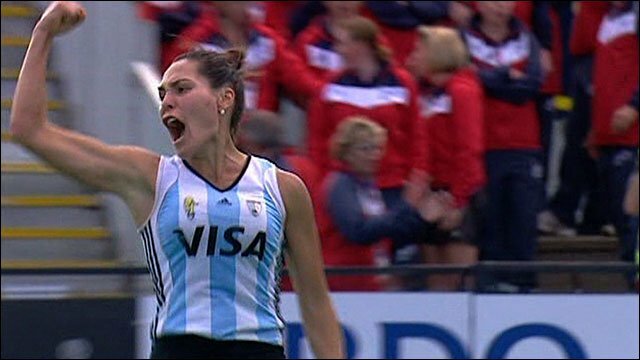 World number two side Argentina picked up the gold medal after Noel Barrionuevo's hat-trick steered them to a surprise 4-2 victory against the only team ranked above them, the Netherlands. New Zealand sprang a surprise on China in Sunday's first game, snatching a late winner to take a 4-3 victory in the play-off for fifth and sixth places. The focus now switches to the women's Hockey World Cup, to be held in Argentina in late August and early September. England's women will travel to the city of Rosario expectant of an improvement on the last World Cup in 2006, where they finished seventh - coincidentally beating Germany for that honour. "We're really looking forward to playing in Argentina," said Kerry. "If there's one World Cup to go to it's in Argentina, the women's game there is huge, with massive crowds, everyone is treated like a superstar. "In my five-year career as head coach, the game I am most looking forward to is playing (fellow World Cup group members) Argentina there." The next World Cup, in 2014, may take place in England after it was announced that an English bid to host both the men's and women's tournaments is in the offing. 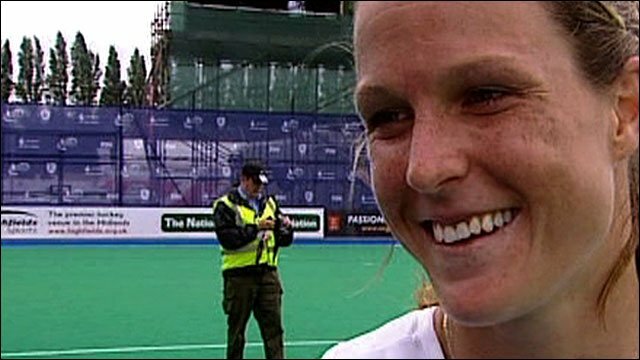 England Hockey is looking to step up its programme of events on home soil, with this week marking the first time the women's Champions Trophy has been staged in this country.